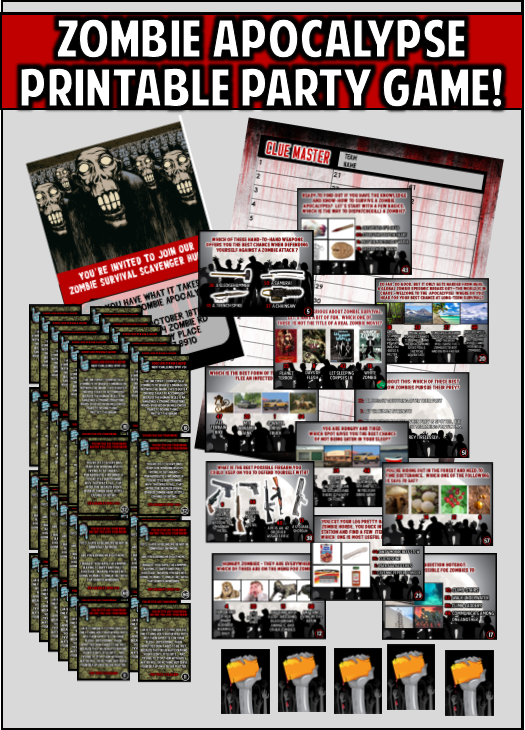 Zombie Apocalypse Game - Printable Scavenger Hunt for your Zombie Party! 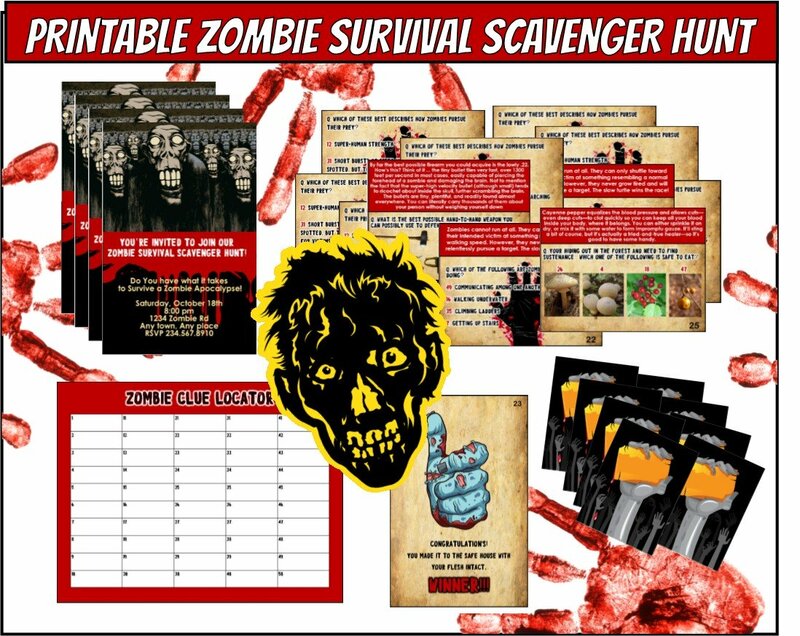 Our printable Zombie Apocalypse game is a survivor trivia scavenger hunt that comes with everything you need to set up and play. 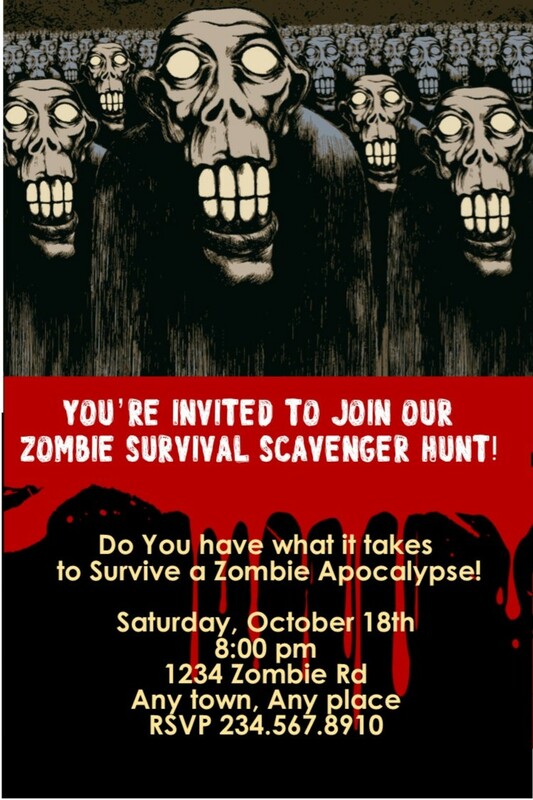 Find out which of your friends have what it takes to survive a zombie attack and which ones are sitting zombie bait! 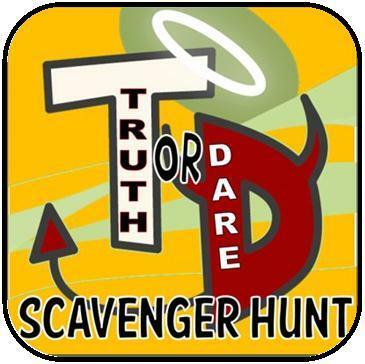 In our printable zombie scavenger hunt players have to answer questions that test their knowledge of zombies and apocalypse survival skills. Each correct answer on the trivia question cards leads to the next trivia clue, then the next. Continuing until all 12 challenges have been passed. 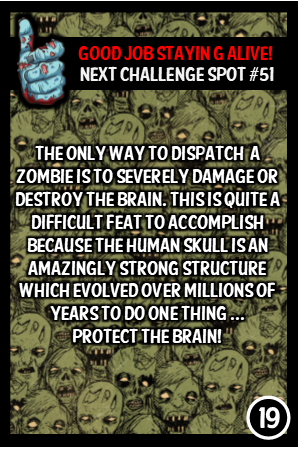 The last clue leads to a a safe haven (perhaps a treasure, prize, or simply bragging rights) The only goal of the game is to make it to the safe haven without becoming a zombie. so How do players become zombies? 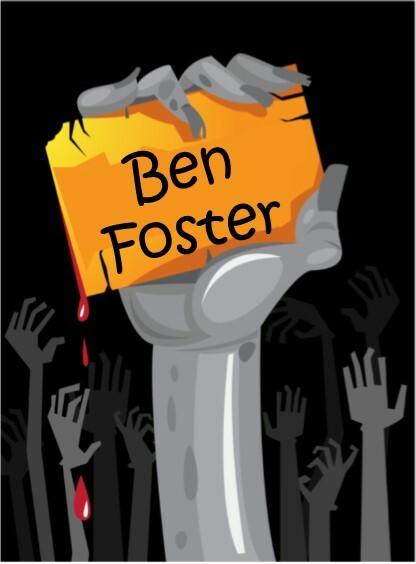 At the beginning of the game one of the players is designated the first zombie. You can decide this by drawing sticks or however you would like. The zombie’s job is to search the party area for the hidden zombie tags. Each Zombie tag has one of the players name written on it, so once the zombie finds that players card all they have to do is touch them and that player becomes a zombie. Once someone is a zombie they join the search for other zombie cards. 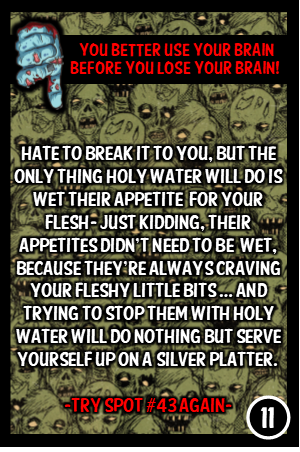 The only goal of the zombies is to make sure no one makes it to the safe haven as a human. How is this Zombie Apocalypse Game SETUP? 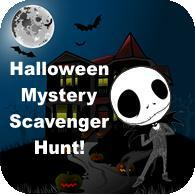 Once you download the scavenger hunt you follow the instructions and print out the clue and answer cards. You will also print out the Clue Master sheet. 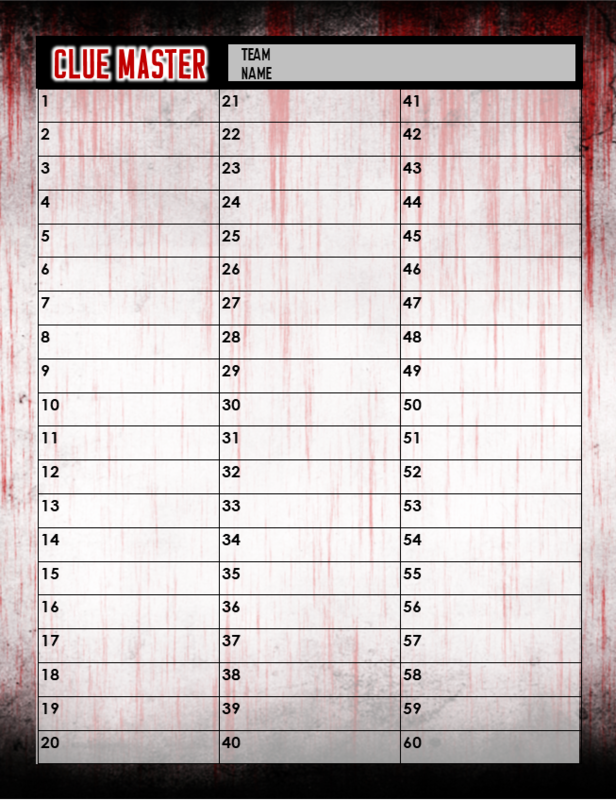 This sheet is a list numbered 1-60. You open this file on adobe reader and type in 60 different hiding locations located in your game area. the only hiding place that might take up any room is the location where you hide the 'treasure'. The others can be hidden in books, taped to table bottoms, walls, under cushions, in DVD cases, anywhere. When you are finished print out the sheet and you are ready to hide the clue and answer cards. 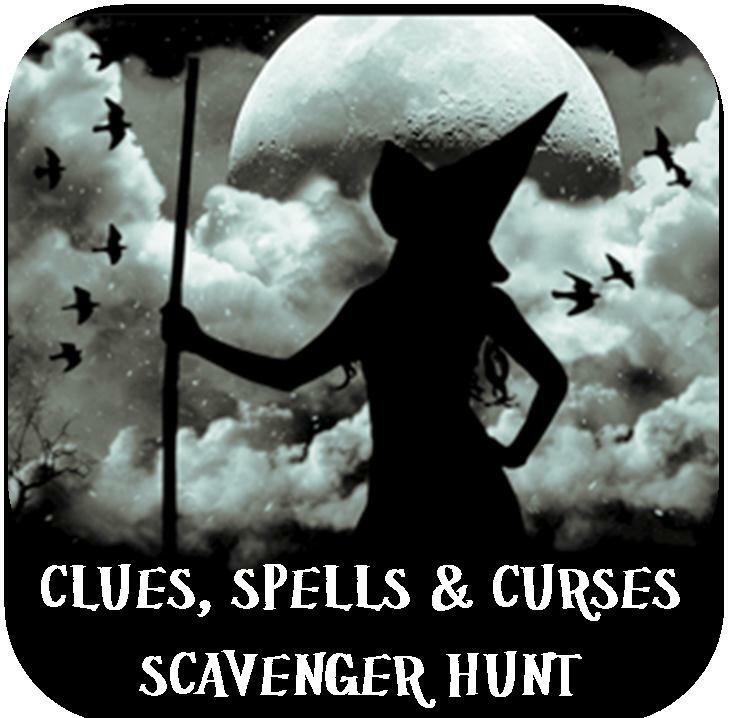 Simply look at the number in the bottom right hand corner of each card and hide that card in the location listed on the Clue Master. The clue with a zombie icon instead of a number is not hidden, that is the first clue and it will be given to players to start the game. This is a sample clue that players would receive in the game. Players would read the question and decide together which answer they believe is the correct one. For example if they all decided that number 32 was the right answer they would look on their Clue Master to discover what location is listed in spot number 32, then they would go search there for the next clue. If they chose the right answer They will find the next clue, if not they will find a card telling them they chose wrong and to try again. Below are the four cards they may find depending on what answer they choose. The correct answer is #19. 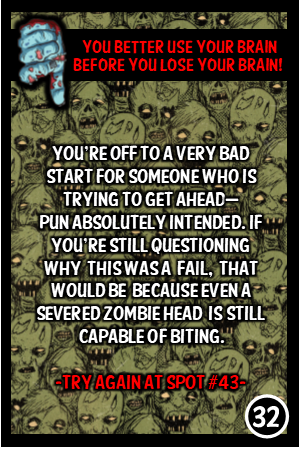 That clue will have a Zombie Thumbs-Up on it and it tell them in what location to find their next clue - the other three cards will have a Zombie Thumb-Down on them. These cards will explain why their answer is wrong and instruct players to go back to the last clue location and try again. What about the zombie TAGS? The zombie tags are also hidden, but the are hidden more like easter eggs – sporadically throughout the hunt area. Some people have chosen to create maps or clues to lead the zombies, but this is not necessary. You don’t want to make it too easy for the zombies to find all the cards because the game could be over before it even gets a chance to begin. Make it a challenge to find the cards because remember for every zombie card found that is going to be one more zombie looking for the zombie cards. What IS THE age range FOR THIS zombie Apocalypse game? 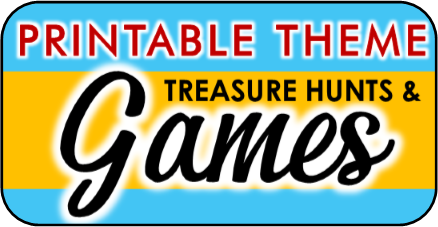 This game is great for teens and adults. 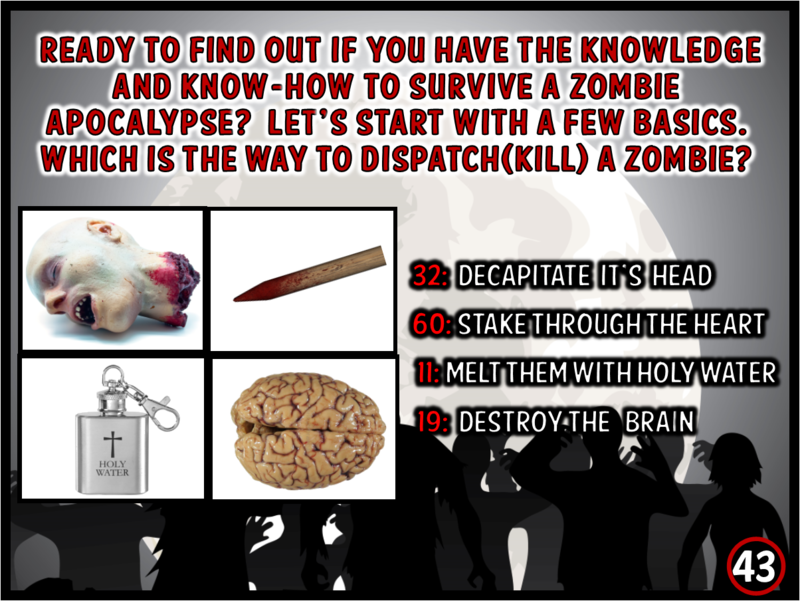 The contents of some of the questions is a bit violent for younger players – I mean it is the zombie apocalypse, these aren’t pretty times. 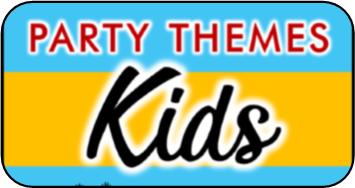 For younger players we have a great selection of ideas for Kids Zombie Party Games. How many players can play this zombie apocalypse game? I would say between 8 – 15. If you have more players you may want to set up two or more different teams. This can be done by printing out as many sets of question cards as there are teams and hiding the question cards in a separate place for each team. 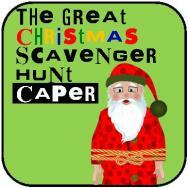 You will just need to give each team a different clue locator sheet with the hiding locations changed for each team. The default locations can stay the same. How long does it take to play the zombie apocalypse hunt? 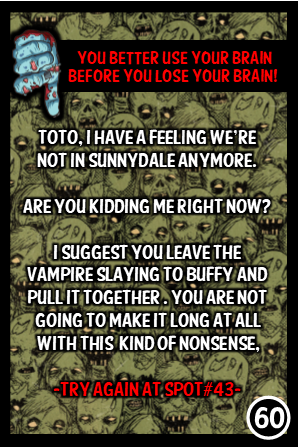 It really depends on how many players are playing, how well the zombie cards are hidden, and how smart the players are, and how big your playing area is ( is this being played in your house, back yard, or across a whole neighborhood or town? ) I would say a short game is 35 minutes, longer games last over an hour. What all is included in the download? GET your zombie apocalypse game now!